This charming true poppy relative is also known as Cream Cups. Easy to see when the cup shaped flowers open during the sunniest time of the day. 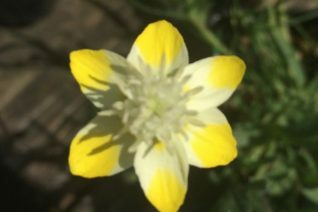 The petals are various shades of yellow with cream veining. Or is it the other way around? Either way its adorable beyond measure as this little thread leaf clump forming true annual pops into bloom in our climate from late April to early June. Not a prolific self seeder but I’ve heard once you get it where it likes it then its yours. To 5″ tall when the flowers top out. Full sun and average to rich well drained soil. Not difficult. West coast annuals are wonderful not only for their color, texture, and forms but of their endearing nature. They are tough little plants with a delicate appearance. Light summer water extends the bloom before high heat finally ends the show and seeds go flying. No shade. Rock gardens, spring borders. High deer resistance. This little beauty though mainly found in California comes just into Oregon in Curry and Josephine counties. Oregon native plant.